Are you interested in the latest, most exciting, and newest, web design trends happening right now? If this is you, well, good! Because, I’m going to spill the beans on what is happening in Web Design in 2019. Personalization of a website and it’s design have been around for a while now, but as more people become more dependent and attached to their devices, the user experience will reach a new level. To increase conversion on your website you need a plan that dives into detail on how you will be personalizing your site depending on a person’s age, gender, and preferences. Personalizing the User Experience (UX) will leave your visitors with the impression to that you are actually taking care of them and their needs, therefore they will choose your product or service. BAM! More sales to you! A voice user interface (VUI) allows people to use voice input to control computers and devices. This technology is still fairly new but growing rapidly because it’s the brains behind millions of gadgets such as Alexa and Echo by Amazon. As a digital marketing agency, creating websites with the latest technology available is imperative to us! And you need to demand the same! Everyone wants the website or app that they’re using to be fast and easy to use. Designs that are time-saving and load faster are becoming necessary as web visitors now have an even shorter attention span. Content that is visual and user friendly makes UX more pleasing and appealing. Website design must be geared towards ease and legibility to truly grasp the end user’s attention. Taking out unnecessary content and images makes UX satisfying and not overwhelming for the users. Great web designers will make content with appropriate, uncluttered, negative space, making it easier to read and engage. Typography on the web is starting to get bigger and bolder making it a trend that is popping up in many up and coming websites. Typography can be visually appealing, but using distracting fonts can make your reader not focus on what you are trying to say, and instead they could become annoyed with your website. When this happens the web visitor is gone. Combining bold typography with a minimalism twist is your winning ticket to look trendy with bold typography. I have a B2B website, I don’t need to look “trendy”. I get this comment a lot. And I’m also able to prove to many of my clients that being “trendy” increases website sales, even if your client is another company. And you know, these website sales are worth thousands of dollars in contracts, right? Augmented reality is mostly seen in games or gaming apps, but it is now becoming a trend in web design. It is being seen often in sales websites and apps. Great web designers are now using GIFs to be more interactive and informative. With GIFs or animations, you can give your site more life by providing more information that is not boring to see or read. These images have interactive options and make the user more engaged on the site. Sticky navigation is becoming more and more prominent in web design. The trend is to have sticky elements at the top, bottom, or sides of the page, so it does not disturb the website visitor. This gives the user more access to more information. You can use sticky elements to highlight a promotion, your social media links, chat-bot, or a call-to-action. If your website has a lot of content, you can use an arrow as a sticky element! This will let your users have the option to click on it and instantly take them to the top of the page. It is easier and more convenient, making for a more pleasurable experience = More Website Sales! Chat-bots allow website visitors the option to ask any question without human interaction. For you, the business owner, it means that you can save money and time -since you don’t need a live person, while increasing sales and efficiencies. Schedule a consultation to see if Chatbots are the right fit for you. The best chatbots can give you a personalize experience where you don’t even know that you are talking to a robot! Progress spectrums are a natural way of measuring progress seamlessly. Designers are using it to break up the unnatural linear steps in websites. These web design tool guides the visitor on each step they are on, helping them know how far they are in the process. This type of tool is very common for ecommerce sites during the purchase process, and restaurants during the order process. For B2B websites, progress spectrums will help visitors have a more enjoyable experience with the site when they are completing a long form. For example, if you own an engineering firm or a construction company, you need your lead to fill out more information than a simple name and email, and in some cases upload files and other requirements. This can seem tedious to your lead, but a progress spectrum can presentthe steps in a more visual way that will alloo wthe lead to follow a long and see the end goal. If you have visited Pinterest, then you are familiar with grid layouts. These types of designs have been more noticeable in web design, becoming the structure of many websites. With grid layouts, you will keep your website elements aligned and displayed in a clean and neat way. A good example is when you are showcasing projects, services, or your latest blog posts. Grid layouts adds to your user experience, ease of use, and clean design. 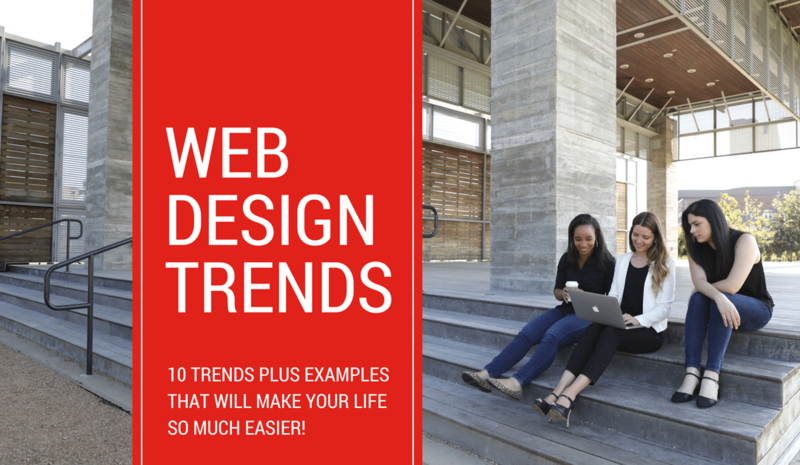 If any other killer web design trends come to mind, leave us a comments below! I think that a new trend will be broken grid design. We are starting to see some already. I’m not sure I 100% agree with the addition of chatbots. It seems to me like they would be less effective as they are invasive. Perhaps when AI advances a chatbot that could actually hold a conversation would be a good addition to a website. That is just my two cents though. Would be interested in seeing the statistics. Yes I completely agree to this outstanding blog! Chat bots works well and it will bring instant conversions to your website since because user’s cant spam it and they will respond only to the relevant query that we have previously setted up to answer. They are going to rock the market in 2019. Thankyou for sharing Key Web Design Trends for 2019 it really guides us to do more things in 2019. The trends for 2019 web design are interesting and I will be looking forward to see which trend overtake other. Web design agency are doing effort to give the best to their valued customer but keeping eye on the trends is essential to stay updated. I am interested to see the chatbots and augmented reality use and how it can be beneficial in term of web design. Really enjoyed while reading the post shared. Keep sharing more! In 2018, designers might finally realize that speed and accessibility are fundamental to providing the best experience for everyone. We’ve been putting pressure on the subject for years, and it seems like a lot of designers and product owners are waking up to the fact their apps and websites are often slow, bloated, and inaccessible to a huge chunk of our population. It’s great that you covered chatbots and sticky elements. Sticky navigation is becoming more popular. Chatbots meanwhile, are being discovered by many companies. Providing around the clock non human support. I see chatbots becoming a big part of websites next year! hello! this is a wonderful website and i usually get pleasure from the details posted here. Bookmarked and shared. Many thanks once again! I am seeing more and more chatbots. We tried for about 4 months in early 2018, and “nobody used it”. I think it’s time we give it another try. Glad you brought up the centered row or section design. We redesigned our site recently and used some 2 column layouts, and I just am not sure if they work as well as the bolder centered text. Yep! Due to the new GDPR the “accept cookies” popups are a must now. Thank you for the great article post! Great Job, very small points discussed the different web design trends. This is a great read actually! User Experience should be the priority because they are the one using or visiting our website, minimalism is also necessary because we are full of clutter in our everyday life that we don’t want to be reminded of it even in the virtual world. I like your blog, there’s so much interesting information. Thank you! We appreciate it and we are glad you enjoyed this blog!